Which color to choose for a shade sail? Choosing the color of a shade sail meets both aesthetic and practical objectives: some colors will be more reflective or better filter the brightness than others. There is no single solution, but rather recommendations according to your region, the style of your home and your exterior decoration. How to choose between light and dark colors? 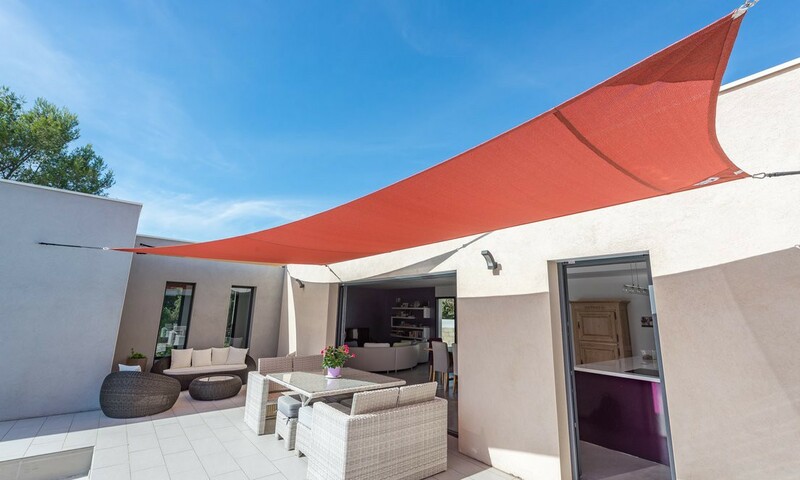 A shade sail aims to protect you from the sun and heat. Dark shades are the most effective in this area. They will be most suitable in very sunny areas, in particular by reducing the dazzling sensation caused by light rays. Conversely, a shade sail in light shades will bring a surplus of light in a region where the sun is less generous. The light will be more reflective, which will help create a more sunny atmosphere for your entire garden while effectively filtering UV rays. You will note however that the maintenance of your canvas will be easier for a dark sail than for a clear sail, the latter being more sensitive to soiling, even with anti-stain treatment. What colors of shade sails for a modern or more classic atmosphere? • An old house will match with beige or unbleached colors, sober and elegant at the same time. • A more contemporary decor will be better underlined by bright, more expressive colors. In the same way, soft colors will create an atmosphere closer to the cocooning, where the more energetic ranges will give a more contemporary and dynamic atmosphere. How to match your shade sail with its decoration? A shade sail is an element of decoration, just like the curtains or the painting of your facade. For a harmonious effect, you can match the shade of the shutters, or opt for cushions in the same color range as your canvas. Today, more and more garden furniture is even colored, which will allow you to multiply the color reminders, for a better decorative effect. 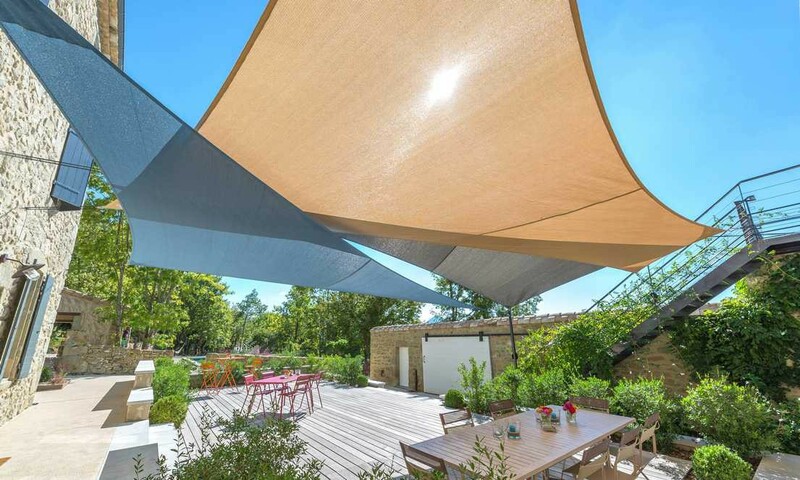 If the surface you have to cover is large, opt for several shade sails rather than just one larger one. You can play on different colors and match them. However, be careful not to multiply the colors, at the risk of creating too much contrast. It is best either to stay on a gradient of the same hues (several blue, or even from blue to green), or to keep only one sail in a sustained tone, which will be emphasized and highlighted by others more neutral canvases. Whatever your final choice of colors, make sure you opt for a treated fabric so that its colors are resistant to the sun and the weather: its color must last for several years without fading. 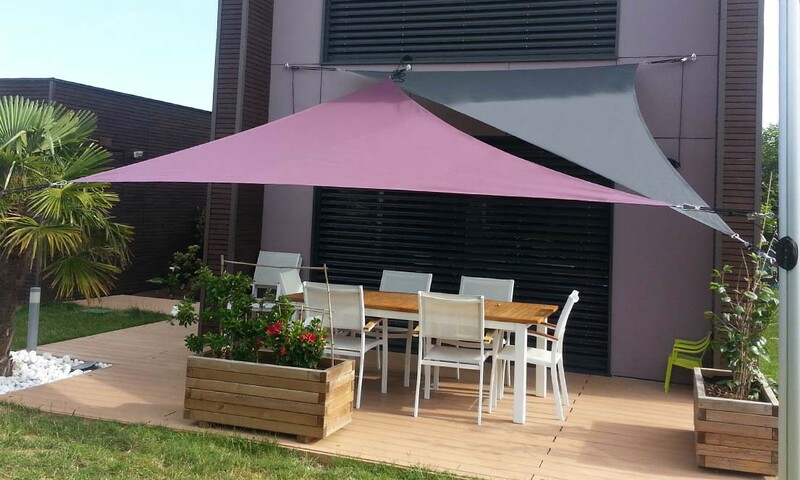 This is the case of all our fabrics for shade sails, from the Australe 220 range (which has 4 colors) to the Acryl 300 range, which presents 25, without forgetting the Australe 340 and its sample of 8 available colors. .
You can even ask us for a sample to check the effect of the hues available in your garden near your home. Because the most important color is the one that will please you, today and tomorrow. To read also: How to hang a shade sail?